Mornac-sur-Seudre, former fishing and trading port in the vast estuary of the river Seudre, is today ranked among the most beautiful villages of France. 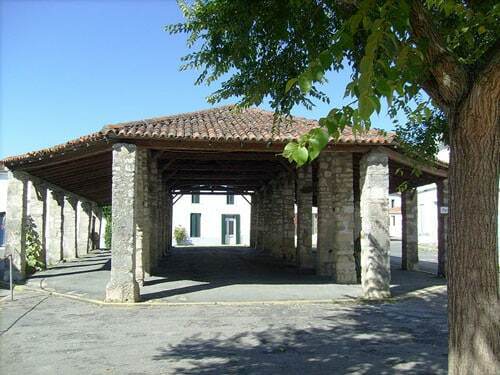 This picturesque Charente village lived for centuries of its maritime trade and has retained the traces of its past in its architecture. Nestled among the marshes, Mornac-sur-Seudre is now mainly focused on oyster farming and salt exploitation. A stone’s throw from Royan, Ile d'Oléron and the Atlantic seaside resorts and beaches, it enjoys a mild ocean climate; the beauty of the landscapes and its renowned Marennes-Oléron oysters complete this long list of attractive qualities. Mornac and the Seudre are indissociable. 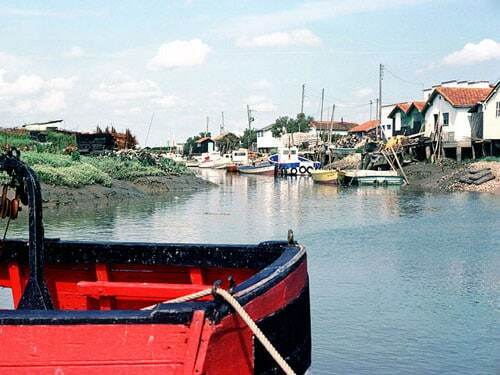 This small 68kms long river ends with a long estuary bordered by marshes and flows into the Bay of Biscay, just opposite the beautiful Ile d'Oléron. The estuary begins at the village of L'Eguille, where the river widens. Mornac is nestled in the deep of the estuary, on the left bank; Marennes spreads at the mouth of the estuary, on the right bank, where a bridge links it to the seaside resort of La Tremblade. The Marais de la Seudre are ancient salt marshes where ostreiculturists have installed the claires where they raise and refine oysters. The Seudre estuary and Ile d'Oléron are indeed the place of appellation of the delicious Marennes-Oléron oysters. The sea plays a major role as the level of the estuary fluctuates with the tides. 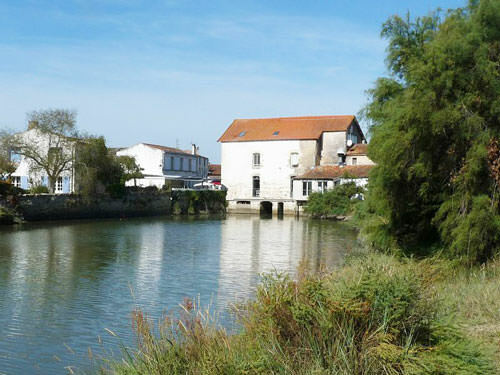 You’ll find one of the last local tidal mills in operation in Le Moulin (today a restaurant) where a lock, operated from within the building, regulates the water of the surrounding marshes. Several discovery trails, such as the Taillées piétonnes (a 5kms hiking trail) crisscross the marshes. They’ll take you to the discovery of this natural and varied eco-system. Indeed, many bird species transit or nest among reeds and aquatic plants that populate the mudflats. These trails will lead you to salt workers’ huts and villages where you can taste freshly harvested oysters. If you cycle, 30kms of marked trails will take you from Mornac-sur-Seudre to La Tremblade, at the mouth of the estuary. Finally, you can also discover the marshes onboard L’Aigrette, (the Egret) a traditional local flat-boat. The Romans developed the salt marshes 20 centuries ago. The lords of Mornac owned most of the estuary during the Middle Ages and developed the salt exploitation. This lucrative industry, which thrived until the 18th century, resulted in the development of several hamlets and villages. By the 11th century, the salt marshes spread out as far as the eye could see. Indeed, Saintonge salt, especially the Blanc de Liman harvested around Mornac-sur-Seudre and L’Eguille, was the best in the region. Mornac-sur-Seudre was then a dynamic fishing port and wealthy village of salt workers (sauniers). Mornac-sur-Seudre preserved and maintained its architectural and cultural heritage and is ranked among the most beautiful villages in France. The Rue du Port, the main street, leads to the port where large-tonnage boats once moored after sailing on the narrow channel that connects it to the sea. They came from all over Europe to load cargoes of salt then used to keep the fish. The old fishermen's houses, built with the ballast stones the sailors left after loading, are witnesses of this bygone era. They line the old town’s narrow alleyways, where hollyhocks freely grow; small white walls that crumble under cascades of flowers often enclose these picturesque white one-storey houses with blue shutters. No more fish stalls in the beautiful 14th century halle (covered market), but a bi-weekly farmer's market full of local products. The lords of Mornac built their castle in the 11th century, as well as a rampart, whose remains are still visible near the village church. The castle’s strategic position and the thriving port, however, fueled the greed of other local dynasties who besieged it several times over the centuries. The region's Protestants seized Mornac in 1622, during the Wars of Religions. They eventually embarked from the small port to flee reprisals after the revocation of the edit of Nantes. But all this is old story! 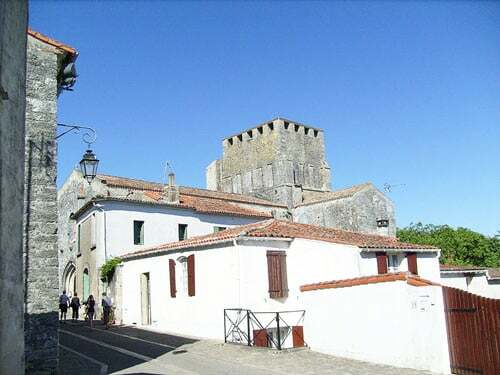 The Romanesque Church of Saint-Pierre de Mornac was built in the 10th/11th century; it replaced the original chapel erected when the village was founded in the 6th century. The building suffered degradations during the Hundred Year War, but was rebuilt in the 15th century. However, the main transformations date from the mid 20th century after a fire caused by lightning destroyed the bell tower. The chancel, transept and the nave are listed Historical Monuments.